Cranmore Mountain Resort, located in the heart of North Conway Village offers 170+ acres of skiing & riding for all ages and ability levels, award winning learn to ski and snowboard programs with dedicated learning area, NH’s #1 Tubing Park with Mountain Adventure Park rides, and signature events for the whole family. Cranmore provides state of the art ski and snowboard instruction utilizing Terrain Based Learning. In addition to Get Skiing and Snowboarding for adults 13+ and KidsRule Mountain Camps for kids 4-14, Cranmore’s Discover Zone offers a place where first time skiers and riders can practice in the Terrain Based Learning Area, with complimentary tips from trained staff. The fun doesn’t stop when the sun goes down. Cranmore is open until 8pm on Saturday and daily during holiday periods with night skiing, tubing and rides, and fun and festive events. Join C-more the Penguin, Cranmore’s mascot, for Cranapalooza. You’ll find smore’s in Schneider Square, outdoor family games and activities, live music for adults in Zip’s Pub & Grill, and fireworks on select nights. The year-round Mountain Adventure Park offers fun for the whole family, skier or non-skier. 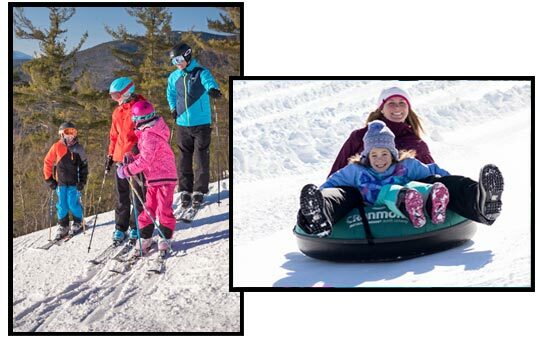 Zoom down the Mountain Coaster, zip on the Soaring Eagle Zip Line, fly through the air on the Giant Swing, and race on a snow tube in NH’s largest tubing park, featuring up to 10 lanes sliding. With endless family activities from learning to ski or ride, resort wide Cranapalooza festivals, live music, family entertainment and more, Cranmore is the place to play this winter. For complete information visit us on the web: Cranmore Mountain Resort.